I have had my MacBook for just over two years. It is an Early 2009 Core 2 Duo model, and it is one of the last white ones. It has served me very well and was a huge improvement over the 12” PowerBook G4 it replaced. My wife has a 2006 Core Duo iMac. It is the first ever Intel iMac. We haven’t had it very long, and before purchasing it I was a little dubious how a 2006 Mac would perform these days. It is running OS X 10.6 Snow Leopard and came with 1 GB of RAM, which was recently upgraded to its maximum of 2 GB. With two Intel Macs, I decided to see how they compared to each other. My MacBook has a Snow Leopard and Mavericks dual boot, and it did have 4 GB of RAM, but for comparison purposes I took it down to 2 GB, to match the iMac. iMac: 17” 1.83 GHz Core Duo, 32-bit, 2 GB DDR2 667 MHz RAM, 667 MHz system bus, 160 GB SATA hard drive, ATI Radeon X1600 graphics chip with 128 MB GDDR3 video memory, 1440 x 900 screen resolution. MacBook: 13” 2.0 GHz Core 2 Duo, 64-bit, 2 GB DDR2 667 MHz RAM, 1066 MHz system bus, 160 GB SATA hard drive, nVidia GeForce 9400M graphics chip with 256 MB DDR2 shared video memory, 1280 x 800 screen resolution. Both machines are running Snow Leopard, fully updated. The iMac is only a Core Duo and therefore tops at Snow Leopard, as Lion upwards requires a Core 2 Duo. 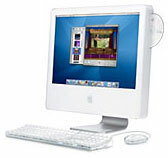 Snow Leopard was the first Intel-only version of Mac OS X, leaving the PowerPC platform behind. It is a very fast, very streamlined operating system often praised for its extreme stability and speed. It may have been Intel-only, but it has a built-in PowerPC emulator engine called Rosetta to run apps that were designed for PowerPC Macs and not updated for Intel. For this reason a lot of people – even now – still run Snow Leopard to ensure compatibility with older software. I love my MacBook. It does everything I need and does it at brilliant speed. I know a newer machine will do everything quicker, but I have no issues with my MacBook so will be holding on to it for a while. My wife loves her iMac, and apart from a small amount of lag on some Flash-based games does everything she needs without the hassles of a Windows computer. Over the past few months I have used her iMac a few times, and it began to strike me that it was far more capable than I had thought it would be. In fact, in some respects it was putting my MacBook to shame. Booting up, the iMac was 5 seconds faster than the MacBook. Loading Safari on both was almost identical, iTunes on the MacBook was a bit faster. Shutting down both Macs, the iMac was nearly half the time – although Snow Leopard is very quick anyway. Both can also handle high definition YouTube videos full screen without any dropped frames. On face value you see the basic tests I did, the iMac has the edge, but why? It has a slower, older processor and system architecture with less video RAM and a higher resolution screen to drive. The MacBook does have the advantage of being able to take more RAM and newer versions of OS X, as well as being 64-bit capable. However, in a direct comparison it would seem a 2006 iMac can outshine a 2009 MacBook. It would be interesting to replicate the test comparing the 2006 iMac to a 2006 MacBook – to get the idea of what both aged machines were like against either other. I would also like to know if a 2009 MacBook Pro performs better – as it aimed at the professional end of their market. Check out my article comparing Snow Leopard with 2 GB RAM vs. 4 GB RAM and OS X 10.6 vs. 10.9 on my MacBook.